Painting is a pain. There’s just no way around it – no matter what type of project you are working on or what tools you have, paining anything is a lot of hard work. However, the entire process can be made drastically easier and less complicated if you use a paint sprayer. Still, there are a lot of different types of paint sprayers out there, with each model made to function under different circumstances and for different jobs. If you’re looking to pick up a paint sprayer for your next project, then this guide is the best place to start. We’re going to cover everything you need to know about all the different models and types, so you can choose one that will perform beautifully for your exact situation and needs. First up, we need to take a look at the different types of operation methods available in paint sprayers, since each one has its own additional requirements and offers different advantages for different situations. There are basically two kinds of paint sprayers you’re going to come across: airless sprayers and compressed air sprayers. Compressed air paint sprayers require you to have your own external air compressor to power the process, so the paint sprayer is actually a gun that stores the paint and connects to the compressor via an air hose. These are often used for automotive painting, woodworking, and some heavy-duty projects. An airless paint sprayer doesn’t need any external air source, as it has an internal turbine that will draw the paint out of the reserve (typically a cup that attaches right to the body of the sprayer), so all you need to do is plug it in to start using it. Airless sprayers are great choices for interior and exterior home jobs, DIY projects, and for anyone that doesn’t want to have a ton of extra equipment around. One key factor that’s going to influence the type of paint sprayer you choose is the type of compounds you want to use, as not every sprayer is capable of functioning with every compound. If you plan on using standard residential paints or thin latex paints, then you’re generally going to be fine with an airless sprayer. Even so, you’ll need to check the operation guidelines for that model to make sure your compound works with it. You may need to thin the compound out a bit, so that it has a lower viscosity, which is a common practice in painting. Certain types of shellacs, wood stains, and other specialty compounds may require you to use a compressed air sprayer, since these models are often made of sturdier materials and better capable of withstanding the high pressures necessary to spray those compounds. Again, you’ll have to do your own research on each model to find out what compounds they support, according to the needs of your projects. Another factor you should consider is the location of the painting project, as some paint sprayers may not be suitable for indoor use. Spraying paint inside can cause some health risks, since you are releasing paint particles into the air. Also, some models may not be appropriately rated for indoor operation, so you should check the product listings to make sure. Similarly, you should understand what kind of access to power outlets you have in the area, as both airless and compressed air paint sprayers will need a power source. Some compressed air sprayers or airless sprayer systems may have longer reach than others, so just keep all of this in mind to make sure you can actually paint the entire area without issue. Ease of use is always very important when discussing any type of tool, since it can directly impact your safety as well as your ability to complete your task adequately. In terms of paint sprayers, this means making sure that you can fit your hand around the sprayer comfortably, as well as paying attention to the weight of the unit. Most compressed air sprayers and some airless sprayers include a container holding the paint attached right to the gun, which can be very heavy and impede your use. If you are concerned about weight, which can affect your precision, then look for models that store the paint in a separate compartment from the spray gun. Generally speaking, most painting projects involve either fine precision detailing (such as staining cabinets or the bumper of a car) or broad coverage (such as painting a wall or a fence). You should always think about what type of projects you are going to be taking on, so you can make sure you find a sprayer that allows you to complete them efficiently and effectively. Many airless sprayers have variable settings that allow you to control the size of the spray fan, setting it to a narrow width for detailing or a large width for more coverage. Check the minimum and maximum widths on these models to make sure they meet your needs. There are a lot of compressed air sprayers that are made for detailing specifically, so keep this in mind if you are looking for one to complete more broad coverage painting projects. Tools that are easy to clean and care for are going to last longer and allow you to do a better job, so you’ll want to find a sprayer that is easy for you to clean. Painting tools are among some of the hardest tools to clean, since they come into direct contact with various compounds that can alter the color or quickly turn into solid buildup, so you’ll have to think about the frequency of use here as well as the cleaning facilities you have access too. Most airless sprayers require the most attention on the paint cups, which can be cleaned in a utility sink. If you plan on doing a lot of frequent painting, such as in a commercial business, then you may want a sprayer that allows for faster cleaning. Basically, you want to make sure you choose a model that you know you will be able to clean thoroughly and comfortably according to your available means and skills. Paint sprayers don’t exactly handle mobility in the same way as other tools, which typically offer some form of cordless option. Every paint sprayer is going to have to connecting to something, whether it’s just a wall outlet or a separate device, so the extent of mobility comes down to the length of the cords and hoses it comes with. If you know you’re going to be moving a lot, think about a model that connects to a compressor or turbine base that sits on the ground. Most of these models come with air hoses that are upwards of 20 feet long, which means you can move quite a bit in a space without having to constantly transport the base. Every tool comes with some kind of additional features and extra functions beyond its main purpose, and paint sprayers are no exception. Most airless sprayers allow you to adjust the direction of the spray (typically between a horizontal, vertical, and circular shape) as well as the size of the spray fan. You may also be able to switch out spray nozzles to achieve different affects, in some cases. Compressed air sprayers may have fewer controls, though many do allow you to adjust the size of the spray. 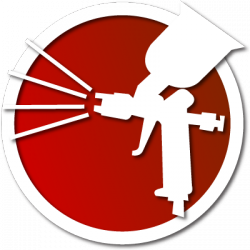 You can also find some compressed air spray gun kits that allow you to attach an air pressure monitor or paint filter directly to the gun, which helps you monitor the sprayer and achieve better results. Choosing the best paint sprayer can be quite the challenge. But, if you take the time to really think about the types of projects you’re going to take on, the types of paint compounds you’re going to use, and the frequency with which you’re going to paint, you should definitely be able to find an amazing model that meets all of your needs.